Germany (2), Turkey, S.Korea (5), Vietnam (3),Thailand, CA, Mexico, Arizona, Maryland, Tx etc.. etc..
General George S Patton Jr. 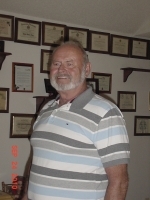 Retired Army, Retired Federal Civil Service Background in Law Enforcement and Security, Investigator. Retired and looking to make an extra dollars. Lead = follow= are get the hell out of the way "Gen G. S. Patton Jr. Learning and helping others to learn and earn on the internet. Never turn down help or refuse to offer help. GOD Bless all. Know love and share it.